HOLLYWOOD—Alexa Davies considers herself the “Number 1” fan of two-time Oscar nominee Julie Walters (“Educating Rita,” “Billy Elliot”). 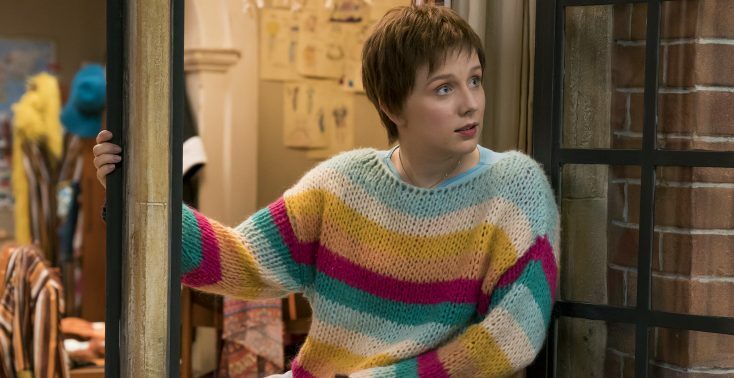 That’s probably a good thing as the spunky 22-year-old actress plays Rosie, a younger version of the same character Walters plays in “Mamma Mia! Here We Go Again,” the feel-good follow up to the 2008 hit musical filled with songs by the Swedish group ABBA. 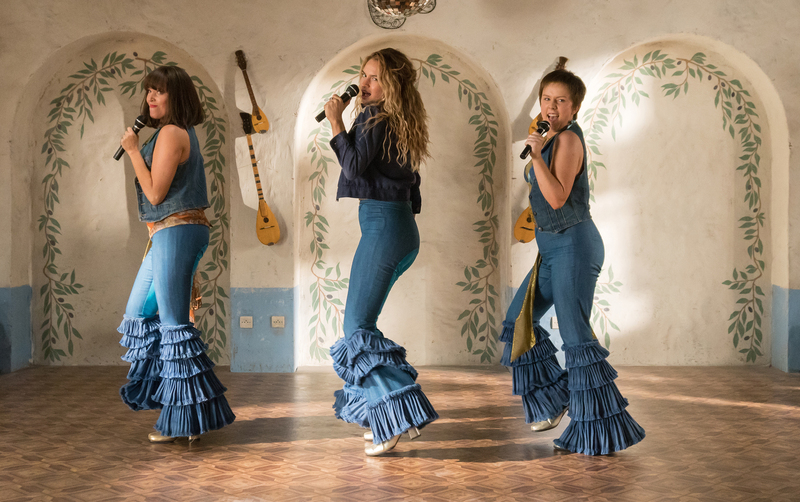 The “Mamma Mia!” sequel is part follow up, part prequel to the 2008 feature based on the popular stage musical. It brings more ABBA tunes (including some deep cuts from the 1970s) along with the original A-list cast together, among them Meryl Streep, Amanda Seyfried, Dominic Cooper, Pierce Brosnan, Colin Firth, Stellan Skarsgard, Christine Baranski and, of course, Walters. It also introduces new cast members including Davies, Lily James, Jessica Kennan Wynn, Jeremy Irvine, Andy Garcia, Josh Dylan, Hugh Skinner, and legendary singer/actress Cher, combining the backstory of Donna’s (Streep) eventful summer that led to her to a life-changing surprise pregnancy in 1979 with the contemporary tale of her daughter Sophie (Seyfried) dealing with her first pregnancy and long-distance relationship with her boyfriend Sky (Cooper) while planning the grand opening of her island resort that was her mother’s dream. As Walters reprises the role of middle-aged Rosie, who along with Tanya (Baranski) turn up to support Sophie’s new business venture on the fictional Greek island of Kalokairi, Davies plays vivacious Rosie as she and young Tanya (Keenan Wynn) arrive years earlier on the island to join Donna (Lily James) after she has had three romances in quick succession, leaving her uncertain and emotional as she discovers she is pregnant. No matter. Her best mates from school are there to support her in any way. They sing and dance as the girl group The Dynamos and have a great time on the island (filmed on the scenic Croatian island of Vis in the Adriatic Sea.) The film is directed by Ol Parker (“The Best Exotic Marigold Hotel”) based on a screenplay he co-wrote with Richard Curtis and Catherine Johnson. Davies, with pixie-like short hair in the film, steals nearly every scene she is in with clever quips and her unbridled lust for life and cute boys that turn up on the Greek island. Just days before the world premiere in London and on the eve of starting her next film project, the actress spoke by phone about her remarkable experience filming the big Hollywood musical—her first—last fall and getting to meet her film idol Walters along with the rest of the famous cast. Q: I heard you already were a Julie Walters fan coming into this. Did you need to prepare much to play the same character as a younger woman or were you set to go? Davies: She’s been my hero since I was a very young girl so when it came to prep, if anything, I had to tone down my impression of her voice, because I was such a huge fan of her character. She’s a real proper character. So, I had to go back to the drawing board and look at Julie’s subtle nuances, her mannerisms and her energy. That’s such an important part of her. It was the most fun research I ever had to do. Q: You shot this last fall, right? Davies: We rehearsed last summer and we started last September. We recorded almost the entire soundtrack before we started shooting. When we came to perform the songs, we were always mic’d in case anything spontaneously wonderful happened while we were performing on camera. Q: ABBA’s Benny Andersson, who wrote the original music and lyrics with Bjorn Ulvaeus, and is an executive producer on the film, was at the recording sessions with you. What was that like? Davies: Benny was always there. He really was at the helm of it. He’s just so passionate about the music and the work. There was one day where Jessica and I were there to record “Kisses of Fire” for the soundtrack. We were going to go meet Benny and sing it for him. We arrived there and he sat at the piano and played it, with zero sheet music. He did it all by heart. And then he told us to get in (the recording) booth so we recorded “Kisses of Fire” there and then. It was just so surreal. He’s such a wonderful man and so clever. His knowledge of music is so amazing. Q: Did you get much rehearsal time? Davies: We got five weeks and it was wonderful. I was so out of my comfort zone because I’d done a little singing before but dancing was not one of my talents. But luckily, Anthony Van Laast, our choreographer, and (his assistants) Lucy Bardrick and Nichola Treherne, made me feel so comfortable and they were there every step to let me know if I made a mistake, and we’d do it again. We had time. So, I was so grateful to have them there. It sounds funny but I saw (the completed film) and I was so proud of myself being able to do the dancing and I was so grateful to them for making me look good, essentially. Q: Did you know your co-stars Lily James or Jessica Keenan Wynn before you were cast in this? Davies: I’d never met either before. I was nervous at first because I knew we were going to be playing the best of friends. Luckily, we hit it off straight away. They’re both such amazing, wonderful women. I’m so glad to have them as friends. Those five weeks of dance and singing rehearsals—you bond over that. We went from the highest of highs to the lowest of lows, all in such a short space of time. By the time the cameras rolled, we knew everything about each other. It was wonderful. Q: What was it like when you finally met Julie Walters? Davies: We were rehearsing our “Mamma Mia” number and I was so red in the face because we had been dancing all morning and suddenly it went silent. Ol Parker, our director, walked in and Dame Julie Walters was behind him. There were all these funny moments on set where the “new” actor would meet the “legacy” actor, and everyone would stand around and stare at them. So, when that happened, I was starstruck by her. She’s the one person I haven’t had a chance to have a proper conversation with. I can’t act normal around her. Every time feels like the first time I’m meeting her. But she’s so wonderful and gracious and I was so lucky that she was so welcoming and generous about this whole process. Q: Doing the encore performance with Meryl Streep, Cher, Colin Firth and everyone else up on stage, what was that experience like? Davies: It was so surreal. The rehearsal was even more surreal. We went in one Saturday morning to rehearse all together. You look around the room and James Bond (Brosnan) and Mr. Darcy (Firth) are catching up before we have to start dancing. It’s just madness. That was a real “pinch me” moment. When we actually got to shoot it, the set was just massive. The Bella Donna hotel set was huge, and suddenly everyone had brought in their friends or their wives or their husbands, because everyone wanted to see Cher and Meryl and everyone together. The set was so full that day. It was amazing. The atmosphere on set was so great, I don’t think I’ll ever feel anything like it again. Q: Was that all choreographed or was there some improvisation in that scene? Davies: Most of it was choreographed. But there were moments where you see the younger cast members and their “legacy” counterparts, very briefly and very quickly. Anthony told us we would be choreographing our separate moments. So, it was kind of like a team-building exercise. So, it was me and Julie and then Jess and Christine and Lily and Meryl—we had to work together to figure out what we were going to do. Julie and I aren’t really dancers, so we were panicking but it was a lovely way to bond with her and a lovely moment to share. Q: As a young actress from a small town in Wales, how has this experience of being in a big Hollywood movie been for you? Do you ever get a chance to go home and visit? Davies: Rarely. But funny you ask because I’ve been planning a massive trip to go back not only to my hometown but just a big tour of Wales next summer. It’s so beautiful and I feel so lucky to have come from there. I’d love to go back more often but luckily I’m busy, which is great. I can’t express how miraculous it all is, really, that I made it from my little town in Wales to here. I still can’t believe it. It’s been six years in the making but I still can’t believe any of this is happening to me. It’s amazing. Q: What’s your favorite ABBA song that you get to perform, or just overall? Davies: “Mamma Mia” is a huge one. When I found out that (Lily, Jessica and I) we were doing the title song that was huge because it’s a massive hit here in the UK. It’s always on the radio somewhere or in the background somewhere. Now, when I hear the ABBA version, I feel so elated that I get to perform it in “Mamma Mia! 2” as Young Rosie and sharing the role with Julie Walters. So “Mamma Mia” (the song) holds a real special place in my heart. Q: When you’re in the costume on that stage in that little cafe, what went through your mind? Davies: It was amazing. We started with “When I Kissed the Teacher” in the first week and then we did “Mamma Mia!” the second week. “Kissed the Teacher” was really difficult in itself. And the choreography is so amazing and the song is so cool. We’d get tired by the end of the day. With “Mamma Mia!” we could go for days and days and do that song, because it’s such a beautiful moment. You see these girls and they’re there for each other. They’re there for Donna when she needs them. The feeling of female empowerment and being up there with your best mates is just amazing. That was a thrill that we could have done over and over and over again. Q: Have you ever gone on a trip with your best friends somewhere cool? Davies: No, I haven’t, but this movie has really inspired me to do so. Funny you ask, because my best friend in the whole world is actually arriving in about 10 minutes. She’s coming to the premiere with me. I’m so excited to see her. I’d love to go back to Vis because it’s so beautiful there. I’d love to show her all the amazing places we got to see. I’d definitely recommend it. I believe it’s one of the most beautiful places I’ve ever been. We were so lucky to be able to wake up every morning, go out on the balcony and see the sea and have a pool. It was just amazing. Q: What did you like about your costumes? Did you have a favorite outfit or accessory? Davies: Yeah. One of my favorite outfits is when me and Tonya arrive in Kalokairi because it was so much fun to wear. I had these shorts and a crop top and a bucket hat and these clogs. I loved it. It was quite unorthodox that I had to sit facing the wrong way on the back of a horse but I loved it. I still have the necklace that I wore in every single scene. It has a little apple pendant on it. I love putting that on every day. Q: Do you regard this as one of the best experiences you’ve had as a professional actress? Davies: It was beyond my wildest dreams. I never thought I’d get to do anything like this. The fact that it’s happened and it’s been such a happy experience, I couldn’t ask for anything more. The only thing I worry about is that I’ve peaked at the age of 22. (She laughs.) We’ll see what the future holds. Previous PostPhotos: ‘Rampage,’ ‘Traffik,’ ‘I Feel Pretty,’ More on Home Entertainment … Plus a Giveaway!! !